This page serves as a collection of useful information for the English and Japanese versions of Paper Mario: The Thousand-Year Door. The Random Number Generator affects many things in this game, such as some spawn points and the movement of NPCs and enemies in the overworld and the effect an item has on an opponent in battle. After talking to the gatekeeper in Twilight Trail, Mario must go talk to the mayor. Normally, Mario would enter the mayor’s house and walk up to him to trigger a cutscene. By walking up against the right side of his house in paper mode, Mario can trigger the cutscene. This works because the mayor moves close enough to the edge of the house such that the cutscene trigger reaches slightly outside of the house. 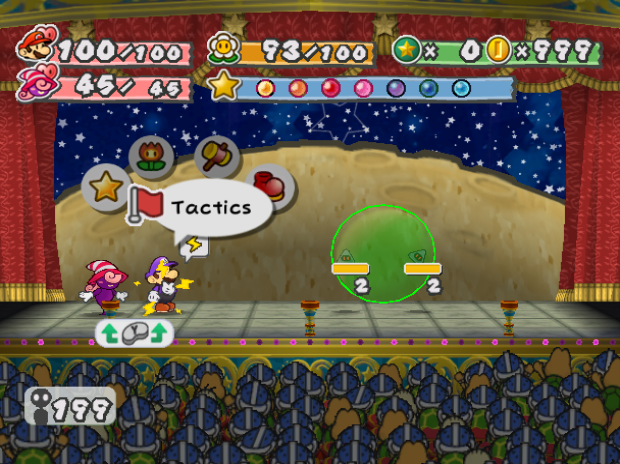 By positioning Mario between two Bill Blasters and flipping into Paper mode, you can walk right between the Blasters and avoid the battle entirely. This has applications in both the Pirate's Grotto in Chapter 5 (see the second clip of the second video in the table above) and the Palace of Shadow in Chapter 8. Near the end of the Chapter 7 factory room, after grabbing the card key, it is intended that you enter the pipe on the floor, go all the way to the left of the background, ride the platform up to the first pipe in the room, and then go up the stairs to Magnus. Instead, you can Spring Jump on the ground and, upon descent, land on the left or right moving platform, skipping traveling through the background again. In addition, you can hover with Yoshi from the card key platform to the top of the save block. This way, you can visually see when the platforms are moving and time when to Spring Jump onto them. Sometimes during Goombella’s ability cutscene in the Prologue, Goomther, whom Goombella tattles to demonstrate her ability, can sometimes exit the screen walking backwards. We believe this is because the Goomther that is loaded in Rogueport Square (as opposed to the one loaded in the cutscene) turns around just as the Goomther in Goombella’s cutscene begins walking away. In Pirate’s Grotto in the bright room, Mario can either jump or hover with Yoshi around the Bill Blasters. This is because the platform past the blasters extends slightly farther up on the Z-axis compared to the bridge to the left. In the room before the boat, you can go into paper mode and walk behind the first set of bills and in front of the second set of bills in order to avoid encountering them. On the way back from the boat, you can skip the first bills by entering the room in paper mode and then moving left slightly before moving down. After this, you can use tube mode to jump over the second set of bills. When Mario jumps onto a switch that raises or lowers a block, there is 1 frame where the game can be paused. Once the game is unpaused, there is another 1 frame opportunity to jump off of the switch while activating it at the same time. This allows hitting some switches without Koops that would normally require his ability, which is particularly helpful when he is not already out. The most significant use of this trick is speed swapping off of the first blue switch outside Hooktail Castle and using the hammer on the second, allowing you to enter Hooktail Castle without using Koops. There are also two currently known uses in Hooktail Castle: jumping off of the green switch that raises the large green block in the big room, and the purple switch a few rooms later. This is a variation of the Flurrie superslide that is only possible on the Japanese version of the game. By flipping into Paper mode with R while activating Bobbery's ability with X and then pressing A to open the door as soon as he explodes, you can clip outside the door just like with Flurrie (though you can't superslide with this method). No use has yet been found for this trick. By Goombella Buffering in the room before Pirate’s Grotto, you can fall out of bounds. There are a few NPCs there because unused NPCs are stored at the coordinates 0, -1000, 0. By falling while riding Yoshi, you can maneuver Mario in the air to land right on top of the ember, triggering the ember fight that normally occurs while rescuing Bobbery. This sets the game to a mid-Chapter 5 state. Since you can warp ahead using this trigger, you no longer need to complete the pre-Chapter 5 sequence which included visiting The Thousand-Year Door, talking to Flavio, Podley the bartender, and Bobbery. This glitch only works on the Japanese version of the game. Holding X until Bobbery explodes, while holding down R and a direction, will cause Mario to walk at full speed while in paper mode. The game thinks that Mario is in his normal state, so he can still open doors. This is useful for Teleporter Room Early (see here). Misleadingly, this glitch can be done without Bobbery by holding down R after leaving a battle. This can also be done by pressing R when entering a tight space that Mario can barely walk through in his normal state and via trap doors. Performing the Bobbery Glitch on the door right before Magnus von Grapple 2.0 will cause Bowser to be in paper mode during the intermission. This causes some very odd effects. Since you are in paper mode, you can also go into tube mode. If you try to jump while in tube mode, the game will lock your Y Speed, your Base Speed, your current angle, and your direction; although you can still move around freely. Since these value are locked, this also allows you to float in the air. Trying to jump in tube mode results in a softlock, because you are unable to go back to normal. If you enter and leave tube mode, another glitch will occur with Bowser's collision with the ground of the area. If you try to walk up the stairs to the Sanctum, you will simply clip into the first two before hitting a wall by the third stair. If you try to walk onto the grass, you will clip through it and fall underneath the level. This will also occur repeatedly each time you respawn, although it is possible to land back on solid ground in some way. If you try to jump while in paper mode as Bowser, you will lose the paper mode properties, and will have similar properties to Bobbery Glitch. Bowser will appear to be in paper mode, but will function as if he isn't in paper mode. Also, you can gain the paper mode properties back by going on the third or fourth stair of the Sanctum. However, if you go down a stair, you will lose the paper mode properties again. It should also be noted that even with being able to jump, Bowser still cannot enter the blue pipe. This is because the game is programmed so that neither Bowser nor Peach can enter a pipe. It is possible to jump from the couch in Grubba's Office up to the air vent. Since the only time you should be up there is after you break open the air vent, there is not a solid hitbox, so you can walk into the vent. This is a progressing trigger that sets the game to the final section of Chapter 3. By using a Goombella Buffer in the room to the left of the 100 Jabbi fight, Mario can go into paper mode to get farther into the back wall, walk left a bit, and maneuver onto the seam of the room. When on the far back seam of the room, Mario can fall below and enter the pipe that is normally only accessible after getting Super Boots to break the platform. Because you still need Super Boots, you need to get them during the escape sequence. Grabbing the Super Boots sets the game back earlier in a Chapter 2, but using the escape sequence pipe to return works because the game thinks it is your first time entering the Crystal Star room. This is also possible by using a double jump on the Piranha Plant below the pipe that you enter. After returning to the foreground in the Chapter 7 factory room, Mario can hover with Yoshi to the left and reach the platform with the card key. This skips the use of a plane panel. You can ride the purple block up in the locked door room to enter the lookout, and can Goombella Buffer through that loading zone. From here, Mario can maneuver out of bounds around the loading zone’s invisible walls and fall down into the room below, skipping the need to grab the previous door’s key. By having Koops hit the yellow block switch while Mario is on it and riding the block up, then making a fairly precise jump over to the platform on the left, walking to the left (and jumping over the Star Piece) and then jumping down to the key, you can unlock the door without ever needing to flip the staircase. This is an alternative to the Goombella buffering method used to skip the same door. Interestingly, releasing Koops earlier and clipping into the lock's corner to make the yellow block rise earlier makes this skip slightly faster than Goombella buffering. Currently, the only reason we go to Chapter 3 is so that the game can advance to a pre-Chapter 4 state so that we can enter Chapter 4. If we were to find a revertible trigger before the log in Chapter 4, then we would skip going to Chapter 3, effectively cutting out pre-Chapter 3 (Don Pianta sequence + Westside Goods + End of Great Tree). There is currently no known trigger or way to do this. In the Japanese version of the game, breaking the block in the Minor League room with the super hammer can cause the game to crash. It seems to only occur when you use a hammer spin right away instead of charging it up for longer. This is only known to occur with this block. This is a theoretical skip. The only reason we need to go to Chapter 6 is for Ultra Boots. The only need for Ultra Boots currently is for one room in Chapter 8. There are two pits connected by an overhead railing. The first pit is very wide, so Mario must Spring Jump and shimmy across. The second pit is short enough across that you can use a Yoshi Hover instead of a Spring Jump to cross the pit. If we found a way to skip the need of Spring Jump in this room, we no longer would need to go to Chapter 6. It is possible to Mowz glitch in this room to get on the seam. From there, you can fall down into the pit's seam and wander underneath the spikes. From here, there isn't any known way to make it up to the next loading zone. Performing a Mowz glitch while jumping doesn't allow for a high enough jump to hit the spikes' hitbox in order to regain control of Mario in the air. In addition, the only reason we go to Chapter 4 is for Vivian and Tube Mode, which both are required for Chapter 6. Therefore, if Chapter 6 is skipped, then so will Chapter 4. This could cut out 30 minutes of in-game time. After getting the Card Key in the large room with conveyor belts and gears, by using Yoshi to flutter to the top of the Save Block and then over to the health-restoring block, you can spring jump up onto the moving platforms and save the time of having to go all the way back up to that part of the room. You can use Yoshi's flutter to fly behind a big green block in Chapter 8 and continue on without hitting a green switch to move the block. When jumping precisely onto one of the top corners of an object's collision box, the game will think Mario is inside the block and eject him a few (up to at least 10.9) pixels higher. This allows him to stand on top of locks on locked doors and objects with similar collision (like yellow blocks) and jump off of them to reach higher places. Jumping into certain NPCs at a certain angle will cause Mario to get temporarily stuck inside the NPC. When he gets pushed out, he is launched at up to 4 speed for a short time. This isn't beneficial to our knowledge. Mario can sell his L Emblem or W Emblem badge while he has it equipped. His clothes will still resemble the Wario outfit, Luigi outfit or Waluigi outfit until he leaves the area, enters the start menu, or saves and quits. The same happens if one of these badges is stolen by a Badge Bandit. If Mario gets hit by the X-Naut PhD when he starts walking through the Chapter 7 factory room bars, it will reset his angle to 90 (right). This can cause him to walk inside of the wall. From here, Mario can simply walk to the right past the barrier. This skips the need for Bobbery, Vivian, and Ultra Boots in this room. It would become beneficial if a future skip for any of these things is found. If you go back to the top of Creepy Steeple after getting Ultra Boots, fall down onto the spring, and begin to charge up a Spring Jump midair, Mario's angle will redirect to 180 (down), sending him out of bounds. He falls below in front of the door, skipping the staircase. Oddly enough, this doesn't seem to work on any other spring besides the Creepy Steeple one. If you walk around in paper mode and a cutscene starts, you will continue walking for the duration of the cutscene. This can be used to save time in Hooktail's Castle and potentially Boggly Woods. Three frames after leaving a battle, the game will reset Mario’s y-speed, causing the game to think he is on the ground and therefore will allow him to do a second jump midair. Depending on how many enemies are in the room, there may be a 2-frame window because it takes a longer time to load. This can also be used to save time in the Boggly Woods plane panel room and for Yoshi Skip. By Fish Glitching inside the statue on top of the boat pad, you can enter Boat mode and sail into Riddle Tower without having to break the statue. Because you can just walk back out of the statue upon returning, you never have to do half of the background. Turn into Paper Mode and fall into the water outside of the Riddle Tower. You now have hitbox glitch. Keep active either Bobbery or Koops. Jump and have them trigger a Chain Chomp battle as you approach one of the two pipes. After leaving the battle, you can double jump up to the mouth of the pipe statue. Because of the active hitbox glitch, you can get farther into the statue than normal. Use a Spring Jump in a VERY precise spot and hold down on the analog stick. You will hit the roof of the mouth of the statue and start floating down, and if done in the correct spot Mario will be set underneath the statue base’s Y position, meaning that Mario will enter the pipe from this point and be able to activate the switch in the background. There currently is no benefit from using this because you still need Bobbery for a room in the Riddle Tower. Use Bobbery/Koops in front of the X-Naut PhD. As you walk through the wall in paper mode, press X to start Bobbery's explosion. If using Koops, hold X and let go when you go through the wall. Jump and enter the battle. Do a Double Jump upon leaving the battle and land on the back wall of the conveyer. From here, you can Spring Jump up to the platforms up top. This skips the need for Vivian in this room, but requires Spring Jump and Koops or Bobbery. It is possible to skip the fire bars in Chapter 8. Hold X in front of the ember to keep Koops active, and then let go as Mario approaches a fire bar. In doing so, the ember fight will start. Run away, and Mario now has temporary invincibility, which is just long enough to walk all the way through. After performing this glitch, enemies appear to freeze in place, but in fact they still move around and ignore wall hitboxes. Having Mario get hit by a hazard updates the enemies positions visually. Interestingly, you can get a similar fish glitch effect by using Koops to hit the Keelhaul Key Wacka and cutscene walking left into the ocean. After getting Bobbery and talking to Flavio after, Flavio will follow you until you go to blow up the entrance to the Grotto. Skipping this cutscene by loading a trigger that occurs later in the game will prevent Flavio from ever leaving Mario’s party. This has some interesting effects later in the game. This can also be done when taking Flavio to Cortez. If you have the blue pipes open already, you can simply go through the pipe while taking Flavio with you. By activating the Super Mario Easter Egg in Chapter 7 with any partner except for Yoshi out, you can duplicate Flavio by having Flavio’s model replace your partner’s. This is only a visual glitch and is assumed to work with other followers as well if you manage to get one there. By using Flurrie and hammering or jumping at the same time, Mario’s direction will lock, allowing him to move around and still face the same way as before. After getting the Blimp Ticket from Don Pianta and exiting his office, you can superslide left from the outside of his office door and walk behind the casino to get to the blimp/train loading zone without having to go through Westside Goods. You can also superslide on the door of the house to the left of the item shop in Twilight Town and precisely seamwalk into the locked storeroom, allowing you to skip getting the red storeroom key. This trick, along with the block switches without Koops tricks, allows you to skip Koops entirely for half of the game. In the Japanese version of the game, Flurrie superslides move Mario along the opposite axis as in the English version. Instead of moving left and right, Mario will move forward and backward. This allows Mario to get on the seam of the inn in Rogueport to get the Ultra Hammer as early as mid-Chapter 2. Zlamp's Description: This glitch begins with activating Flurrie and then opening a door 3 frames later. This causes Mario to use Flurrie while walking into a building. By letting go of the analog stick (holding a direction will end the superslide) and pressing X more times, Flurrie will reactivate, which can cause Mario’s angle of entry to change significantly. In the English version of the game, Flurrie Supersliding will take you left or right, depending on which way you are facing. In the Japanese version of the game, Flurrie Superslides will send you down on the Z-axis (towards the camera). By either going into tube mode and moving down from the spikes or performing a fish glitch, Mario can make it to the boat and grab the Gate Handle. This avoids the long process of going into boat mode at the very top of the Grotto, going down the waterfall, and then going left. This glitch occurs after doing Cage Skip and getting the Super Boots. This glitch will also only occur if you have the punies following you, and not at the pedestal already. When you re-enter the Crystal Star room, there is a chance that the game can do a "long load", in which the game stays at a black screen in order to load more stuff before resuming. When this occurs, the punies will go through the pipe animation before Mario, and will get to the pedestal before Mario is done coming out of the pipe. When this happens, the Crystal Star cutscene will start, and will cancel the ending of the pipe animation. Because of this, your partner will likely look glitchy, and Mario will retain some of the properties of being in the pipe animation. This glitch is only possible on console, as it involves the disc not being fully read, so it has to be read again. It’s currently only known to work in the Chapter 2 Crystal Star room. This occurs in the Japanese version of the game in the Glitzville staircase room. If you jump up to the top of the yellow blocks from the lowest stair, go up against the back of the wall, and alternate between right and up-right, you can clip into the back wall and walk around out of bounds. For all cannons in Chapter 8, you can go into paper mode and maneuver through them. Recently it was found that you can Spring Jump up against the back of the wall and land on the torch. From there, you can simply jump right over the cannons. Using this glitch on the North Rogueport loading zone causes Mario to enter a walking animation while Goombella starts talking. He walks off, even though the loading zone has an invisible wall. As soon as Goombella’s textbox closes, Mario takes the loading zone, no matter what position he’s at. This effect can also happen in some other areas, such as in the Great Tree and at Rogueport Harbor. This glitch does not produce the same effect as the Mowz glitch because using Goombella produces a different cutscene value. You could theoretically skip the Prologue Goomba Trio battle if you were able to enter the pipe that is behind the bars. This is possible after the fight using Staircase Skip, but it does not work before the battle because there is an extra invisible wall. You can perform a Hyper Jump to the right of the pipe platform ledge, but the moving platform does not move while performing the Hyper Jump, so you can’t land up top on the moving platform. In Chapter 8, Mario can hover with Yoshi behind the green block to skip going left and hitting the green switch to lower the block. By jumping, holding down B during descent, then charging up a Hammer Swing, Mario will do a Hammer Swing without having to hammer beforehand as intended. Going into paper mode and then falling out of bounds, getting hit by a hazard, or bouncing off of a spring while in paper mode and not holding R causes the game to change Mario back to normal, but causes him to retain odd hitbox properties that can allow him to squeeze into tighter spaces than normally possible as normal Mario. This can be used to save time outside of Flurrie’s house. HCE is a theoretical glitch that would involve somehow activating the switches within the two stone objects in the first room of Petal Meadows. If Mario could somehow activate them both in the allotted time, then this would skip going through Petalburg and Shhwonk Fortress. If this is performed on the Japanese version of the game, you need to complete a post Chapter 1 trouble that will give you Koops, since you can’t do Koops skip. On the last frame before entering a loading zone, you can hop off of Yoshi while entering the next room, saving a few frames whenever you need to hop off of Yoshi. Using Bobbery and having him explode on the first frame that you talk to Dark Bones in Chapter 8 causes Bobbery to remain in a permanent state of exploding, causing all a Dry Bones in the room to get hit when Bobbery is close to them. This can be performed with either Flurrie Supersliding or performing a Bobbery Glitch on the Lovely Howz of Badges door. It allows you to set an Item Shop item's ID to 0000 (No Item). This happens because the glitch most likely duplicates the flag that checks whether the item is bought and sets the original flag to "bought", while the copy is still set to "not bought". The Invalid Item appears to require 0 coins and 0 BP, and through repeatedly entering and leaving the shop and buying and selling regular items, you can make the Invalid Item disappear off the shelf entirely. However, as the item isn't real and can't be bought, this glitch has no practical use. Performing two superslides and then entering and leaving a building results in the badge shop badges appearing in the middle of Rogueport at coordinates (0,0,0). Loading the shop 8 times will cause all of the text in the game to appear corrupted upon walking up to the badges. In the Japanese version of the game, the Shadow Queen’s hands can sometimes not appear in either phase of the fight. This is purely a graphical bug, so the hands still function as normal. You can jump into certain cutscenes to cover more distance as a cutscene begins. This is applicable in many places, such as the Prologue Lord Crump cutscene and Hooktail Castle Koops cutscene. Using Koops far away enough when retrieving an item allows for a 1-3 frame window to move. In this window, you can jump away, saving a few frames. He disappears from the partner menu after getting Flurrie, but reappears after Doopliss 2, just like Yoshi. This trick only works in conjunction with Shop Key Skip. Otherwise, Mario cannot access the tube mode curse chest room in the back of the item shop in Twilight Town. This means that this is currently an English exclusive trick. Jumping along the Z-axis against the edge of a lock allows Mario to clip up to the top. This is useful in Hooktail's Castle when using Staircase Switch Skip because it skips having to hit the purple switch. It is also useful before entering Bobbery’s chimney because it skips using a Yoshi hover to reach the boxes in East Rogueport. By getting the Merlee coin curse to happen after a battle, you can allow certain animations to complete that you started before entering the battle, such as spring jumps and turning into boat mode. This will sometimes allow for some interesting effects to occur (more info coming soon). By manipulating RNG and standing near NPCs, Mario can control how NPCs move. The best example is in the Rogueport sewers outside of the Teleporter Room. The bandit will move for a bit and then stand still. Changing RNG will cause the Bandit to move in different directions. If the bandit doesn’t move in quite the right direction, Mario can stand next to the Bandit to keep it from moving, and then move away again when RNG sends him in a desired direction. This can be used to have Mario clip into the floor with tube mode right in front of the Teleporter Room. You can push Bobbery out of bounds in any corner in the game. Nothing significant comes from this as far as we know. This is a precise jump out of bounds onto the train tracks. Unfortunately, there are no loading zones in that area and the wall is too high to reach the pipe to the blimp, so there is currently no way to utilize this clip. This theoretical glitch involves skipping a section of the Palace of Shadows. This would occur in either the first, second, or fourth room before Gloomtail by somehow falling beneath the floor and entering a loading zone that is always present, even if the floor beneath it isn’t loaded. At the minimum, this would skip Gloomtail and the Palace of Shadows, approximately 15 minutes of in-game time. In the best case scenario, meaning that it would not require Yoshi, tube mode, Vivian, Bobbery, or Ultra Boots, then this would save close to 2 hours. The route for the best case scenario would be Prologue, Chapter 1, Chapter 2 up until Super Boots, Ultra Hammer Early, Teleporter Room Early, Chapter 7, Chapter 8. There currently is no known way to either clip through the wall or fall through the floor in any of these rooms. The most likely room is the room right before Gloomtail. Present in this room are 2 Embers and a save block. It is currently impossible to reach the top of the save block. Even from the save block, there isn’t any way to get out of bounds in the room. The ceiling is solid, so an infinite height exploit wouldn’t help. There are 3 theories currently. The first is somehow decreasing Mario’s hitbox value. The second is changing Mario’s angle upon entering the room. The third is entering a battle while using Vivian. Mario’s hitbox value is defaulted at 20. When in paper mode, his hitbox decreases to 6, which makes sense since paper mode allows Mario to move through tighter spaces. Mario is able to use one of the corners of the room to clip out of bounds normally when he is at a hitbox value of 1.7 or lower. There currently is no known way to reach such a low hitbox value. Mario’s angle upon entering the room is either 90 degrees or 270 degrees, depending if he is coming from the left of right. If his angle was to change to 15 (from the left door) upon entering, he would walk onto the back seam of the room. If that value is lower, Mario would walk straight up, causing him to fall out of bounds instead of walking onto the seam (unless it was changed further into the entering animation). There currently is no known way to change Mario’s angle during these cutscenes. The third and most recent theory is entering a battle while using Vivian. If Mario were to enter a battle while using Vivian, walls would become disabled. This is because Vivian’s cutscene value is added to the battle’s cutscene value and therefore is stored after the battle even though Vivian would be sent behind you (and deactivated because of it). Mario could then simply walk onto the seam of the room, use Vivian again to return to a normal state, and fall off the level to land on the loading zone below. In Chapter 8, there is a loading zone where entering while in paper mode and letting go mid-transition cause Mario to appear in paper mode, even though he has full normal walking speed and his normal hitbox value. Holding a specific direction against the rightmost tent in the Keelhaul Key camp can cause the camera to continuously shift over. This works on all versions but acts less chaotically in the Japanese version. Performing the Boggly Woods plane panel cutscene walk too early will cause Mario to enter the pipe and fall down. This occurs because the pipe is still growing higher while Mario spawns. There are 2 methods to doing this. The first is Japanese only. Using Bobbery Glitch on the door to the Shadow Queen room can allow Mario to finish the game in paper mode during all the cutscenes. After the first phase, you must hold down R because there is a one frame window where Mario can move. If you don't hold R, he will unspin from paper mode. Alternatively, you can enter the room normally and just hold down R after the first phase. Unlike the first method, Mario won't move during the Crystal Stars cut scene, but everything after will be the same. Pressing R to go into paper mode right before falling off a ledge causes Mario's momentum to cancel and resets his angle to 180.05 (down on the Z-axis) in the Japanese version of the game. In the English version of the game, using a momentum cancel will cause Mario’s angle to reset to 270 (left on the X-axis). After performing Paper Mode Ending, if you load another save file while holding down R, you will begin in paper mode, even if you don't have paper mode in the current save file yet. This is not useful besides being able to access the Pit of 100 Trials in the Prologue. Entering the Poshley Heights Inn and doing a Bobbery glitch before taking to the innkeeper causes Mario to go up and rest in bed while in paper mode. When he returns downstairs, he does not move in his walking animation and proceeds to move very strangely. You can unspin from a tight area and quickly clip back into it, causing Mario to get pushed around and even go through a wall. Jumping on the same frame of unspinning, spin jumping, and then holding the opposite direction that Mario is facing will cause Mario to walk backwards. Pausing first frame after regaining control of Mario causes Mario to pass through enemy hitboxes. This can be used to skip a battle in Hooktail's Castle. Upon first moving in tube mode, your speed starts off at 0 and gradually increases to 3. Pausing at any point during the speed up and unpausing will cause Mario to instantly jump to 3 speed. Pausing while jumping can allow for a Hyper Jump. If you use an item when the game registers Mario on the ground, Mario will shoot up in the air 60 units high, which is higher than a regular jump. Pausing while hammering and then using an item can sometimes cause Mario to softlock because he will continue to hammer, even after the animation for the item has ended. Whether it softlocks or not seems to be random. Pausing while unspinning from paper mode causes Mario's unspin animation to cancel, returning him to his normal state immediately. Using Koops and then pausing as Mario falls onto Koops’ shell cancels Mario’s jump off of the shell, allowing him to move immediately after unpausing. Going into paper mode and entering a battle right before falling into water causes Mario to respawn wherever he entered the room from. In addition, the camera is locked, just like during a Fish Glitch. With a precise position outside the house of Twilight Town's mayor, you can trigger the cutscene of seeing the mayor as a pig without having to enter the house. By Goombella Buffering into the loading zone right after getting Bobbery, maneuvering around to the right, and using Bobbery inside of the wall, Mario can open the Pirate's Grotto Early. Using a cutscene walk, you can skip a glitchy cutscene that occurs because Flavio isn't present. This saves time over going back to talk to Flavio. Returning from the plane curse room and moving at (1,255) causes Mario to fall out of bounds. This isn't useful at all. During the plane game, you can quit right before landing, press continue, and jump. Doing this repeatedly will allow Mario to jump all the way to the right. Using the plane panel ability on the Z-axis edge of a panel causes the game to think that Mario is not above a panel. This means that he can dip down earlier and pick up speed faster than intended. While in Hooktail Castle the second time to get Ms. Mowz for the Fish Glitch, you can use Yoshi's flutter jump to skip one of the plane pads. There are several triggers in the game that, when activated, will jump the game ahead to that point. Facing the Punies and then jumping away from them allows Mario to keep all the Punies without them following him. This can be used to skip the bubble room and water switch puzzles. In addition to this, a similar thing can also occur if you drop down from a high ledge while having the punies with you. If you keep jumping after you reach the ground, you will not lose the punies, even though they are on a different level than you. This can be used several times in The Great Tree to skip having to take the punies through entire rooms to the pipes. There is a 2 frame window to move after activating Red Bones. By jumping one frame after activating Red Bones, the game thinks that Mario's jump is stored next to Red Bones. This causes Mario to enter the Red Bones battle immediately upon the player gaining control again. This saves time over hammering all the Dull Bones in the room. This doesn't work for Dark Bones in Chapter 8 because the game doesn't give you an extra frame to move after starting the cutscene. There are several revertible triggers that, when activated, set the game back in time. When pressing X to use Yoshi's ability, you have 5 frames to move around before you begin to get on him. Transitioning to Yoshi takes 25 frames when getting on, and 20 to get off. Yoshi is used often because riding him is the fastest method of movement, though there are some rooms where it's slower to ride him. If the distance you need to cover takes 77 or more frames with Mario, it is faster to use Yoshi. If the distance you need to cover takes 42 or less frames with Mario, it is faster to walk. For every case in between (distance takes 43-76 frames with Mario), testing should be done to see which is faster. If it were possible to get up on the top ledge in the Riverside Goomba room right before the Ultra Boots, then we could skip the Goomba battles and get the Ultra Boots right away. Currently, this isn’t possible because the height difference between the switch boxes (30) and the top ledge (120) is too large for a double jump. If the difference was approximately 10 units smaller this would be possible. By jumping precisely into an NPC, Mario will get trapped inside them. If he keeps moving in the same direction, he will be ejected at more than double his walking speed. Unfortunately, this speed boost cannot be stored with the Speed Swap Glitch, so this is currently useless. You can Spring Jump along the left side up on the Z-axis to skip a plane panel in the Poshley Sanctum. In the Rogueport Sewers, there is a room containing 3 Shine Sprite blocks and 3 Spanias. You can stand on one of the lower Shine Sprite blocks and use a Hammer Spin to hit the highest Shine Sprite block. In Boggly Woods, Mario can get pushed out of bounds between the left wall and the leftmost tree right after the Shadow Queen fight. Because he entered the room all the way from the right, Mario will respawn there, which saves time over walking all the way right. If Mario is positioned high enough or low enough on the Z-axis, he can jump along the Z-axis and bypass the Shadow Siren cutscene in Chapter 8 after solving the Riddle Tower. It’s faster to do it farther down on the Z-axis as opposed to performing it up on the Z-axis. Use a Goombella Buffer to bypass the left loading zone of the Shhwonk Fortress. From there, move left onto the edge of the loading zone platform and move up on the Z-axis. From there, you need to jump diagonally down right. Maneuver on the front seam of the Fortress room over to the right. Go down on the Z-axis and slightly to the left. This makes the game register that Mario is outside of the loading zone area, so he can move back right and trigger the loading zone. In the English version of the game, you can use a Flurrie Superslide on the leftmost building outside of the Twilight Town shop and maneuver around to the back of the shop. This allows you to reach the back of the shop without grabbing the key in the fallen tree room to the right. This is not possible on the Japanese version of the game because Flurrie Superslides send Mario down on the Z-axis. You can hold down after Spin Jumping on one of the warp pipes’ blue switches to fall into the water. Mario will respawn at the last point that he walked on, as opposed to falling down from the switch and having to fish glitch a second time. Jumping immediately after Frankie and Francesca talk to Don Pianta causes Mario to land really close to Don and block his movements. Don is coded to start a walking sequence before giving the blimp ticket, but because he never walks he never gives Mario the item and instead stands there forever. Loading too many entities in-game will eventually cause the game to softlock. For example, this can occur if you load the Inn more than 4 times during Ultra Hammer Early, because Flavio’s text boxes are loaded too many times. If you perform the invalid item glitch 8 or more times and then try to buy or sell a badge, you will softlock too. If you spam X to use Flurrie multiple times, the Jabbi fight can end as Flurrie's animation begins. This causes Mario to continuously hold Flurrie even if she moves away. In the Japanese version of the game, Flurrie Supersliding on the Rogueport Sewer’s item shop after doing a Bobbery Glitch similar to the one during Teleporter Room Early causes Mario to fall below into Merluvee’s room. If you go try to have her tell you a fortune, the game will softlock because it gets confused, since it hasn’t loaded Merluvee yet. In the Japanese version of the game, you can pause underground whenever you use Vivian. If you pause during the Vivian partner cutscene in Chapter 4, the game gets confused and you no longer can control Mario once you close the pause menu. Go to any sort menu within the start menu (can be the one for items, key items, badges, tattles, the badge database, or emails) and hit A and Start simultaneously. Doing this will cause the game to think you are still in the sort menu the next time you open the menu, but the normal cursor will still be available to use (although invisible). This allows you to sort any of those categories within the start menu every time the A button is pressed. Using an item while this glitch is active allows you to sort it to another position within the item menu during its use, causing it to remain there instead of being removed. This means that by using this glitch, you can reuse any HP or FP restoring items infinitely many times. This glitch can also crash the game if you obtain it using the sort menu for emails and then sort the emails using the first sort option while having one open to read (requires at least 2 emails to pull off). Speed Glitch refers to a sudden increase in Mario’s speed when jumping right when he returns from a battle (1 or 2 frames earlier than the double jump frame). There are four different speed values that can be produced by four different scenarios. With scenarios 1 and 2, you can also get an extra 4 units of jump height if you enter the battle with no speed along the Y-axis by jumping 2 frames after getting the initial speed glitch. Scenario #1: Walking Mario can walk into an enemy when he is on the ground and jump first frame after leaving. In doing so, this causes Mario to reach up to 2.969 speed. If you stop walking or jump, your speed resets to normal. Scenario #2: Backwards Walking Hitting the A button to jump with a direction at the same time as unspinning from paper mode allows Mario to walk backwards. If he walks backwards into an enemy while on the ground, the speed glitch can still be performed, but with a speed of 2.55 instead of the original 2.969 speed. Scenario #3: Paper Mode Spin into paper mode right before entering a battle. Hold A, R, and a direction on the first or second frame after leaving a battle. Mario will have 1.19 speed as opposed to his normal 1 speed in paper mode. Scenario #4: Falling Depending on an enemy’s height, you can sometimes get speed glitch. After triggering a battle by jumping on an enemy, Mario slowly falls. If he is low enough to the ground, Mario can still store his Y-axis speed after the battle. Mario can be anywhere from 0 to 4 units off the ground. If he is within this range, his speed will reach 2.6775, which is the same as the speed when speed swapping. Oddly enough, Mario slows down for a bit once his invincibility frames end. Moving up or down is faster than moving left or right. The game takes 2 frames to updates Mario’s, Peach’s, and Bowser’s speed normally. By moving up or down for one frame and then jumping in any direction, Mario maintains his greater speed value. Jumping first frame possible when landing from a previous jump maintains this speed value. This method requires jumping, so it is only used when playing as Mario. A variation of this is a 2 frame speed swap, wherein Mario, Peach, or Bowser can move up or down for 2 frames and then move in any direction for 14 frames without losing the greater speed value. This can be used with Peach and Bowser and occasionally used with Mario to cover more distance whenever jumping doesn’t reach a loading zone or a door completely. This glitch allows you to reach the key to Grodus’ room without the use of Yoshi, meaning that if a future glitch is found that obsoletes getting Yoshi, we can still reach the end of the game. There are several ways to maintain the Z-axis speed while walking on the X-axis. This can be done because (in most cases) it takes 1 extra frame to update to the correct speed. Which method you use depends on whether or not you're capable of jumping. Jumping: Walk on the Z-axis for 1 frame, then press A (jump) and go either left or right on the next frame. This can be constantly repeated. Not jumping: Walk on the Z-axis for 2 frames. For the next 14 frames you can maintain this speed in any direction. This can also be constantly repeated. This glitch does not work while riding Yoshi. For some reason, the game is better at updating Yoshi's speed than that of Mario, Peach, or Bowser. Mario's speed while walking on the X-axis is 2.25 units per frame. Z-axis movement is always 1.19 times faster than X-axis speed for any given character, meaning that Mario's speed while walking on the Z-axis is 2.6775 units per frame. Peach and Bowser's X-axis speed is 2 and Z-axis speed is 2.38. Yoshi's X-axis speed is 3.375 while his Z-axis speed is 4.01625, meaning that Yoshi is 50% faster than Mario. In the Palace of Shadows room with the two pits, Mario can Yoshi hover across the second pit, skipping having to Spring Jump and shimmy across. This is not possible across the first pit because it is wider. After the Goomba Trio fight in the Prologue, you can jump from the second stair to the moving platform rather than walk all the way around. This saves a few seconds. It is possible to ride the yellow block up to where the star piece is, walk left for a few seconds, and fall down below to the platform next to the switch. This skips hitting a switch twice to flip the staircase horizontally and then switch it back. If Mario uses Koops and then falls out of bounds while holding him out with the X button, Koops will spawn slightly above the ground in the same spot as Mario while still spinning in his shell. When you let go of X, Koops will shoot out to the spot that he would have reached if shot from his original position before respawning. By pausing on top of a switch, such as the Hooktail Castle pipe switches, Mario’s momentum gets cancelled. When you regain control of Mario, you can immediately jump in any direction, rather than have the switch send Mario bouncing up in the air slowly. This can be used throughout Chapter 1. This trick also allows for Koops Skip, though only the English version can complete the game without getting Koops from Chapter 1 due to the specifications of Shop Key Skip. The first mechanic of this glitch requires Mario to perform a Bobbery glitch by holding Bobbery over his head until he explodes. When he explodes, you hold down R. This causes Mario to walk as fast as normal but while in paper mode. In doing so, you can also open doors while in paper mode. This causes Mario to remain outside of the building when entering. Now the camera is rotated 90 degrees. From here, since you’re still outside of the building, you can perform a Flurrie Superslide, just like during Ultra Hammer Early. Because the camera is rotated, Mario moves down on Z-axis, relative to the screen's rotation. This means that Mario slides down into the Teleporter Room. Currently, the game doesn't think you’re in Chapter 7, so you have to read a note that makes the game think Mario is indeed in that chapter. This skips grabbing the sixth Crystal Star, the Peach and Bowser intermissions, Fahr Outpost, and the General White Hunt. Just like Ultra Hammer Early, this is a Japanese-only glitch because of the superslide mechanics. This can be done without the use of Bobbery, but is slower. The space between the fallen pillar and the railing slightly south of the eastern loading zone is small enough that pressing R causes Mario to get pushed through while turning into paper mode, causing him to maintain his full speed while staying in paper mode. This can also be done by obtaining hitbox glitch and walking underneath the sides of the fountain statue the same way you would with the pillar. This means that if something is found that eliminates the need for Bobbery, you could still perform this glitch to do the trick. In the 3rd tile room, either running onto the tiles and then hopping on Yoshi, or running onto the tiles on top of Yoshi and then hopping off causes the tiles to significantly speed up. In addition, it is possible to catch the first tile cycle that occurs when entering the room by waiting a few seconds and then Yoshi hovering to the left. The tiles swing around close enough to the platform by the door that Mario can make it across, saving a few seconds. This glitch essentially allows for the Great Tree escape timer to be shown on screen in areas that it wasn’t intended to, but can also cause some weird after effects if done in the right way (see Cutscene Walk Method). This is the easiest way to keep the timer on screen. All you need to do is use the trapdoor or super boots during the escape sequence to revert the game to before the escape and still keep the timer on screen. Then simply leave the tree before the timer runs out and the timer should stay on screen for as long as you don’t re-enter the tree (kills you if you do) or go to the Hooktail Castle spike room and leave (removes it from the screen like it normally would during Chapter 1). Wait until the timer reaches near 0. Use a paper mode cutscene walk to enter a pipe or loading zone after the timer runs out. When using this method, the game will think you are in a Chapter 3 state (more specifically, having just entered Glitzville). Also, the Punies will remain outside of the tree, like they are for the rest of the game after Chapter 2 normally. In North Rogueport, jumping backwards from the rightmost part of the high ledge allows Mario to land out of bounds behind the back railing. From here, he can walk left or right for a decent amount. When out of bounds, Mario cannot access the train or blimp pipe in any way because of the train being too high off the ground and there being invisible walls around the pipe area. If Mario either unlocks a door or opens a chest at an angle, pressing A first frame can cause him to jump while the unlocking/opening animation plays. This allows Mario to land closer to a door or farther left or right in a room when opening a chest. Using a Flurrie Superslide when re-entering the inn from the top can allow for Mario to stop moving on the seam of the building. From here, he can maneuver around the edge of the building and walk along the front seam towards the Ultra Hammer chest. With the Ultra Hammer, now retrieved 4 chapters earlier, you can open up the warp pipes and also use Bookcase Jump and break open the air vent to end Chapter 3 quickly. By flipping into Paper mode, walking into a tight space between two solid objects and then unflipping in that area that's supposed to keep him flipped, Mario will sometimes clip into both objects. This can be used to enter buildings without having to unlock or open the door. This doesn't have any use in a speedrun yet. Using Vivian while entering the teleporter room door or Bobbery’s house door causes Mario's momentum to cancel. When he reappears from the ground, he doesn't enter the building all the way, leaving him out of bounds. For some reason, this only works in these 2 places. If you use an item outside of the door while using this glitch, a glitchy animation ensues. If you use an item on the inside of the door while using this glitch, Mario will go through the door normally. Walking at an angle of 79 or 177 with Mario (or 82 or 174 with Yoshi) causes Mario to boost off of walls for a slight speed increase. By using either Fish Glitch or Ultra Hammer Early, you can open the warp pipes. In doing so, those pipes now appear in that chapter. This means that you can leave after completing Pirate’s Grotto and warp to Poshley Heights to enter the train. In the Chapter 2 water switch room, releasing Koops to hit the switch while entering the pipe causes Mario to enter the pipe during the water draining cutscene, which saves time over entering the pipe after the cutscene is done. In Hooktail's Castle, it is possible to jump from the right platform through the window, skipping hitting a switch with Koops. In Chapter 8, you can flip into Paper mode and jump up the slope of the wooden wheel and over to the next platform. This skips having to get a key, unlock a door, enter a light code, and return to the wheel to get across. Pressing B or X to hop off of Yoshi right before entering a loading zone causes Mario to hop off of Yoshi while entering the loading zone. This way, Mario doesn't waste time hopping off of Yoshi in a room. While on Yoshi, Mario retains his hitbox value of 20. Because Yoshi has greater speed, sometimes Yoshi's greater speed allows Mario to clip through certain things that he otherwise would not be able to. An example of this is on top of Bobbery's house. Yoshi can clip through the roof, skipping the need to go down the chimney in tube mode. Because the house was never loaded, the walls are not solid. After talking to Bobbery, you can walk through the wall instead of opening the door. This glitch can also be used in Petalburg and on the screen with the entrance to the Great Tree, though it’s meaningless. You can skip Yoshi when entering Chapter 4. In the west sewers, hold X with Koops out. Walk on top of the trash to the left between the two platforms. Let go of X and jump on top of the trash. Leave the battle and do a double jump. Jumping at a slight left angle allows Mario to clip to the top and enter Twilight Town without Yoshi. Note: you do get Yoshi back after Doopliss 2 since the game thinks you already got him. Because you did not get the Yoshi or name the Yoshi, his color is the default green and his name is the default "Yoshi." If a Yux, Z-Yux, or X-Yux is in a burn status with at least one of their Mini-Yux(es) out, when the Yux is defeated from burn damage, the Mini-Yux and shield stay in battle. The battle continues even if the Mini-Yux is the only remaining enemies. It only ends after the Mini-Yux is defeated. Cronikeys for discovering most of these tricks and Nathanisbored for finding a few others. And to Malleo, SolidifiedGaming, Zephiles, Cronikeys, Almo, Daieihoonbag, aldelaro5, Tiwill14, CoolKirby2000, Nathanisbored, Zlamp, Samura1man, GigaDB, GumboIsland, N_man36, Masterjun, Kimimaru, mugg, Brown Bomber, Mark Wong, Sillygramcracker, Really_Tall, MilesSMB, and NamiNami for contributing the tricks ported here from [https://docs.google.com/document/d/1Xoywf1TZvNUXNH8LADBuXhuUkh1qj8VPT8gE1fzLnQc/edit#|this Google Doc].